Whether you want to tour important religious sites or explore the city's 22 wineries, you'll have no shortage of things to do in Nashik. Start off your visit on the 24th (Mon): take in the spiritual surroundings of Kapileswara Temple. For where to stay, ratings, other places to visit, and more tourist information, go to the Nashik trip itinerary planning app . Chandigarh to Nashik is an approximately 8-hour flight. You can also do a combination of flight and bus; or drive. Wrap up your sightseeing on the 25th (Tue) to allow time to drive to Shirdi. Kick off your visit on the 26th (Wed): contemplate in the serene atmosphere at Maruti Mandir, contemplate the long history of Baba's Chavadi, examine the collection at Dixit Wada Museum, take in the spiritual surroundings of Dwarkamai Masjid, then take in the spiritual surroundings of Shri Saibaba Sansthan Temple, and finally contemplate in the serene atmosphere at Khandoba Mandir. For traveler tips, other places to visit, maps, and tourist information, use the Shirdi online tour itinerary planner . You can drive from Nashik to Shirdi in 1.5 hours. Alternatively, you can take a bus. In June, daytime highs in Shirdi are 39°C, while nighttime lows are 27°C. Finish your sightseeing early on the 26th (Wed) to allow enough time to drive to Aurangabad. A place of history, culture, and spiritualism, Aurangabad appeals to a growing number of pilgrims and tourists looking to get more out of their vacation in India. 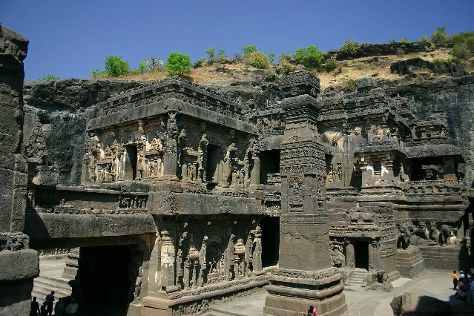 On the 27th (Thu), admire the landmark architecture of Bibi Ka Maqbara, delve into the distant past at Daulatabad Fort, then contemplate in the serene atmosphere at Grishneshwar Jyotirlinga Temple, then tour the pleasant surroundings at Ellora Caves, and finally explore the historical opulence of Chini Mahal. Get ready for a full day of sightseeing on the 28th (Fri): explore the activities along Panchakki (Water Mill), Head underground at Aurangabad Caves, and then contemplate in the serene atmosphere at Bhadra Maruti. For reviews, other places to visit, traveler tips, and other tourist information, you can read our Aurangabad online trip builder . You can drive from Shirdi to Aurangabad in 2 hours. Another option is to take a train. In June, daily temperatures in Aurangabad can reach 39°C, while at night they dip to 27°C. Finish up your sightseeing early on the 28th (Fri) so you can travel back home.